The Pearl Chamber of Commerce is presenting Sergeant Bennett with a framed certificate, a $100 Outlets of Mississippi Gift Card and a Cracker Barrel Gift Basket along with a complete meal for two. Derek Havard with McIntosh & Associates donated a $50 Logan’s Roadhouse Gift Card, Scotts Miracle Gro donated a Fit Bit; H&R Block donated a $25 Kroger Gift Card, The Pearl Municipal Credit Union donated a $25 Visa Gift Card; The Outlets of Mississippi donated a $25 Gift Card; McAlister’s Deli donated a dinner for two; Mickey Anderson Photography donated a complimentary family photo shoot and Signmark donated a duffel bag. We are proud to announce that Officer Brandon Jordan was selected as the January Officer of the Month. Officer Jordan graduated from the Mississippi Challenge Academy at Camp Shelby in 2009 and later graduated from MLEOTA in 2014. Officer Jordan’s instinctive and observant style of policing ended the escapades of a serial armed robber. On December 22, 2016 while patrolling the City of Pearl, Officer Jordan spotted a suspicious vehicle on Pearson Road. The vehicle was sitting in the Subway parking lot with a male driver. Officer Jordan’s instincts told him something wasn’t right with this vehicle. He remembered a description matching the vehicle that he had just spotted. Officer Jordan waited for the vehicle to leave, developed probable cause, and stopped the car. The driver was identified and later confessed to the planning of an armed robbery at Subway. He also confessed to other robberies of multiple businesses in bordering cities, as well as several in Madison. This stop was one of the best in our department’s history. This stop prevented an armed robbery of the Subway on Pearson Road and potentially many more. Not only did he prevent an armed robbery in our city, he brought closure to many others. It also ended this serial robber’s crime spree. Officer Jordan demonstrates a tireless work ethic and is a very intuitive and observant Officer. We are fortunate to have him at the Pearl Police Department. The Pearl Chamber of Commerce presented Officer Jordan with a framed certificate, a $100 Bass Pro Gift Card and a Cracker Barrel Gift Basket along with a complete meal for two. Derek Havard with McIntosh & Associates donated a $50 Logan’s Roadhouse Gift Card; Bullock Investigations donated a $25 Gift Card to Sombra Mexican Kitchen; Shane Fletcher with Farm Bureau Insurance Agency donated a $25 Visa Gift Card; McAlister’s Deli donated a meal for two; Tempstaff donated a $25 Gift Card to Bonefish Grill and Scott’s Miracle Gro donated a soft side cooler. We are pleased to announce that the Pearl Police Department Officer of the Month is Officer Alfred Jenkins. Officer Jenkins is a Pearl High School graduate and began his career in 2003 with the MS Department of Corrections. He later worked at the Jackson Police Department before starting to work at Pearl PD in 2012. He served as a Reserve Officer and a Patrol Officer before becoming the School Resource Officer at Pearl High School. In addition to working at the High School during school hours, he also works most of the after school activities including football games, track meets and band competitions. Officer Jenkins is highly respected by the staff and students at the school and is a valuable asset to our community. The Pearl Chamber of Commerce presented Officer Jenkins with a framed certificate, a $100 Bass Pro Gift Card and a Cracker Barrel Basket complete with a meal for two. Derek Havard with McIntosh & Associates donated a $50 Moss Creek Fish House Gift Card; Bullock Investigations donated a $25 gift certificate to Sombra Mexican Restaurant; The Alumni House Sports Bar & Grill donated a gift certificate for dinner for two; The Pearl Municipal Credit Union donated a $25 Visa Gift Card; McAlister’s Deli donated a certificate for a meal for two; Firestone donated a Free Oil Change; Pizza Inn donated 2 complimentary buffet meals and Signmark donated a soft side cooler. We are pleased to announce that the Pearl Police Department Officer of the Month in August was Officer Steven Culberson. Officer Culberson has been in law enforcement since 2006 and with the Pearl Police Department since 2016. He responded to a call where an elderly man was choking on food. When the officers first arrived the man was unconscious and not breathing. Officer Culberson performed the Heimlich maneuver with no results, then an abdominal thrust to try to dislodge the blockage and finally a finger rake with no success. He then began CPR and finally the man took a gasping breath. He was then transferred to the local hospital and on last check he was listed in stable condition. In addition, Officer Culberson was patrolling an area after a residential burglary when he spotted the suspect’s vehicle. Upon checking the vehicle, the suspect was found to have stolen items from the burglary in the front seat. After getting him in handcuffs, with help from Sergeant Race Gordon and Detective Jim Brown, they proceeded to the residence where they also found three juveniles with drugs and arrested all persons involved. These are just two of the cases that demonstrate Officer Culberson’s dedication and commitment to his job and the city of Pearl. The Pearl Chamber of Commerce presented Officer Culberson with a framed certificate, a $100 Bass Pro Gift Card and a Cracker Barrel Gift Basket complete with a gift card for a meal for two. Mickey Anderson Photography donated a complimentary Family Photo Session; Coffee News donated a $25 gift card to Moss Creek Fish House; The Pearl Municipal Credit Union donated a $25 Visa Gift Card; Jose’s Mexican Restaurant donated a $20 Gift Certificate; Pizza Inn donated 2 complimentary buffet meals; The Alumni House Sports Bar & Grill donated 2 complimentary lunches; McAlister’s Deli donated 2 complimentary meals and Signmark donated a soft side cooler. We are proud to announce that the Pearl Police Department Officer of the Month in June is Officer Ruben Miles. Ruben has been a lifelong resident of Pearl, MS and graduated from Pearl High School in 2010. He enlisted in the Mississippi Army National Guard and graduated Military Police School from Fort Leonard Wood, Missouri and was assigned to the 113 Military Police Company in Brandon, MS. Ruben deployed with the 112th Military Police Battalion in 2011 for support of Operation Enduring Freedom / Operation New Dawn with the 1st Brigade Combat Team 34th Infantry Division. While in the Army he completed numerous courses and received many awards such as the Global War on Terror Expeditionary Medal, National Defense Service Medal, Overseas Service Ribbon, Global War on Terror Service Medal, and the Armed Forces Reserve Medal. Ruben was hired with the Pearl Police Department in May of 2012 as a dispatcher. He graduated from the Mississippi Law Enforcement Officer Training Academy in 2013 and he now works on the Patrol Division and is also a part of the Pearl Police Department Honor Guard Team. Officer Miles responded to a call made by a man whose sister worked at a local Chevron store. The store had closed and he could not find her. The lady’s boyfriend called to say that she had texted him to say that she had cut her wrists. Officer Erwin and Corporal Miles arrived on the scene but could not locate her. Both officers refused to give up and continued the search until they found her in a small room behind the carwash with a red bandana wrapped tightly around her neck. She was gasping for air and almost unconscious. Corporal Miles pulled a pocket knife from his pocket and with surgical precision cut the bandana from around her throat. If it were not for Corporal Miles’ persistence and quick response the lady would not have survived. The Pearl Chamber of Commerce presented Officer Miles with a framed certificate, a $100 Bass Pro Gift Card and a Cracker Barrel Gift Basket complete with a Gold Card for a meal for two. Moss Creek Fish House donated a $25 gift card; Buckley Security donated a $25 Kroger gift card; MedScreens donated a $25 Subway gift card; The Pearl Municipal Credit Union donated a $25 Visa Gift Card; McAlister’s Deli donated a meal for two; Jose’s Mexican Restaurant donated a $20 gift certificate and Signmark donated a soft side cooler. We are proud to announce that the Pearl Police Department Officer of the Month in May is Detective Jim Brown. Jim is a retired Master Sergeant in the United States Air Force Security Police with 26 years of service. After his retirement from the USAF in 2006, Jim served for 5 years as a Conservation Officer with the MS Department of Wildlife, Fisheries and Parks, operating the Turcotte Education and Shooting Facility. In 2011 Jim continued his service as a Law Enforcement Professional with the Pearl Police Department where he is currently a Detective with the Criminal Investigations Division. Jim is certified in many classes and is a certified instructor in numerous classes. The list of his credentials is very long and extremely impressive. Jim has also had an extensive teaching career. He is currently certified as a firearms instructor with the State of Mississippi. Jim is the author of the plan of instruction for the Enhanced Carry Qualification Course, Mississippi Concealed Carry Weapon Permit. On April 13th Detective Jim Brown responded to a medical call in response to a 30 year old male not breathing. Once Det. Brown arrived on-scene he made entry to the residence and saw an older male attempting rescue breathing on the 30 year old male. He then checked the gentleman’s neck and arm for a pulse and discovered that no pulse was present. He contacted headquarters and advised them that he was initiating chest compressions. Det. Brown began and continued chest compressions until the Pearl Fire Department and Pafford arrived on-scene. Once other emergency responders arrived, he continued chest compressions while medical responders prepped him for further lifesaving actions. After being informed that they were ready to take over, he stopped administering chest compressions and allowed medical personnel to take over. Immediately after stopping, it was obvious that the gentleman now had a pulse. He was transported to a local hospital for treatment. Though medical help was not far away, Det. Brown chose not to wait and took immediate action that saved the man’s life. The Pearl Chamber of Commerce presented Det. Brown with a framed certificate, a $100 Bass Pro Gift Card and a Cracker Barrel Gift Basket with a meal for two included. Moss Creek Fish House donated a $25 gift card; Buckley Security donated a $25 Kroger gift card; The Pearl Municipal Credit Union donated a $25 Visa Gift Card; McAlister’s Deli donated a meal for two; Jose’s Mexican Restaurant donated a $20 Gift Certificate and Signmark donated a soft side cooler. We are proud to announce that the Pearl Police Department Officer of the Month in February is Officer Brad Chisholm. Officer Chisholm graduated from Clinton High School in 2001 and enlisted in the United States Marine Corps in 2002. He received basic EMT Training in 2003 at Holmes Community College and then later graduated from Holmes with an Associates Degree. He went on to Mississippi College where he received Bachelors of Science Degree and then afterwards obtained a Masters Degree in Administration of Justice. While in the Marines he completed numerous courses and received many awards such as the Navy Marine Corps Achievement Medal, Outstanding Volunteer Service Medal, Iraq Campaign Medal, Global War on Terror Expeditionary Medal and Combat Action Ribbon. He joined the Mississippi Air National Guard in 2013 and continues to serve as Staff Sergeant. He also completed many courses with the National Guard and received the Small Arms Expert Marksmanship Ribbon. During his military career he has been deployed twice to Iraq. Officer Chisolm came to work for the Pearl Police Department in March 2014. During a traffic stop another vehicle pulled up and two occupants stepped out of the vehicle; a female driver and a male that was bleeding badly from his arm. During the process of skinning a deer, the rope broke and caused the knife to be impelled into his forearm cutting an artery. Officer Herrin radioed dispatch and requested an ambulance and fire personnel for first aid. Officer Chisolm arrived on the scene and immediately grabbed the bleeding man’s arm and put pressure on the brachial artery to slow the bleeding until the ambulance could get there. Pafford Ambulance arrived and transported the gentleman to the hospital. He received numerous stitches to his arm and was told by the E.R. Physician that if Officer Chisholm had not acted quickly to slow the bleeding that he could have easily died from major blood loss. The Pearl Chamber of Commerce presented Officer Chisholm with a framed certificate, a $100 Bass Pro Gift Card and a Cracker Barrel Gift Basket along with a meal for two. Moss Creek Fish House donated a $25 Gift card; Buckley Security donated a $25 gift card to Kroger; Reliant Physical Therapy donated a $25 Subway Gift Card; the Pearl Federal Credit Union donated a $25 Visa Gift Card; McAlister’s Deli donated a certificate for a dinner for two; Melissa Wade with Southern Society Real Estate donated a $10 I-Tunes Gift Card; Signmark donated a soft sided cooler and Fowler Chiropractic donated 8 deep tissue laser treatments valued at $320. We are proud to announce that the Pearl Police Department Officer of the Month for October is Officer Jeremy Haywood. He is a graduate of Jim Hill High School and the Jackson Police Academy. Officer Haywood worked at the Jackson Police Department before moving to Pearl and going to work at the Pearl Police Department. He is married to his wife Jennifer and has three beautiful daughters, Haiden, Addyson and Paityn. On October 7th a report of an armed robbery was called in by the victim. Officers quickly responded and began gathering facts and canvassing the surrounding area. The victim reported the suspect as being armed with a semiautomatic handgun. This made the search ever more imperative due to the danger that he posed to the public. Officer Haywood located a male matching the description of the suspect provided by the victim. This person was sweating profusely as if he had been running for a lengthy period of time. Officer Haywood detained this person and brought him back to the area in order for the victim to attempt identification. The victim positively identified the person Officer Haywood detained. Without the quick response, attention to detail and his methodical canvass, this suspect may have escaped apprehension. The suspect had run home to the apartment where he lived and changed clothes so that the description would not match the victim’s statement. It was only by great police work that Officer Haywood was able to recognize him as a person of interest. This isn’t the first time Officer Haywood has been responsible for the capture of felony suspects. Officer Haywood approaches every call with same careful attention and examines every possible detail. This is one of the traits that makes him a stellar police officer. Officer Haywood never wants any credit and attributes every capture to the team effort. We are very pleased to be able to honor him with this award. The Pearl Chamber of Commerce presented Officer Haywood with a framed certificate, a $100 Walmart gift card and a Cracker Barrel Gift Basket along with a gift card for a meal for two people. Derek Havard with McIntosh & Associates donated a $50 Applebee’s Gift Card; Buckley Security donated a $25 Subway Gift Card; MedScreens donated a $25 Kroger Gift Card; Moss Creek Fish House donated a $25 Gift Card; The Pearl Municipal Credit Union donated a $25 Visa Gift Card and Jose’s Mexican Restaurant donated a $20 Gift Certificate. Signmark donated an insulated bag and Fowler Chiropractic donated a certificate for 8 deep tissue laser treatments valued at $320.00. 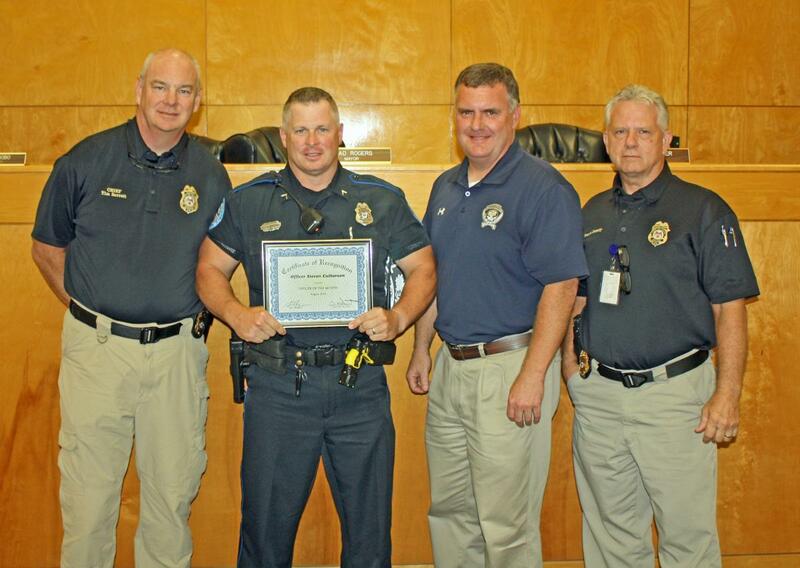 We are pleased to announce that the Pearl Police Department Officer of the Month is Officer Ronnie Decell. Officer Decell graduated from Simpson Academy in 1993 and from East Tennessee Police Academy in 1996. Officer Decell began his career with the City of Pearl in 2006 as a firefighter with the Pearl Fire Department. In 2009, he was promoted to Lieutenant. In 2012, Officer Decell started working as a reserve police officer. Later in 2013, he joined the Pearl Police Department as a full time officer. He later joined the SWAT Team . His certifications include both police and fire training including EMT, rope rescue I and II, confined space rescue, hazmat tech I and II, fire officer I and II and Basic SWAT certifications. On May 31, 2015, Officers were dispatched to a shooting call at the Highlands mobile home community. Upon arrival it was determined to be a self-inflicted wound with a tremendous amount of blood loss. Officer Decell assisted other officers on the scene with his medic training by quickly applying a combat application tourniquet until the ambulance and first responders could arrive. As a result of Officer Decell’s advanced training, EMT experience, and life saving measures, the victim was transported to a local hospital where he lived another 24 hours in enough time for his family to be contacted and make it to the hospital before he passed away. If asked about that day, Officer Decell would simply say he was doing what he was trained to do not only as a police officer but also as his experience as a firefighter. He would also divert any credit from him to his fellow officers that were there that day. For his actions, efforts, and response on that day Officer Decell is the June Officer of the Month. The Pearl Chamber of Commerce presented Officer Decell with a framed certificate, a $100 Gift Card to the Outlets of Mississippi and a Cracker Barrel Gift Basket along with a gift card for dinner for two people. Buckley Security donated a $25 gift card to the Tropical Smoothie Café; Derek Havard with McIntosh & Associates donated a $50 Applebee’s Gift Card; Moss Creek Fish House donated a $25 Gift Card; MedScreens donated a $25 Kroger Gift Card; The Pearl Municipal Credit Union donated a $25 Visa Gift Card; Scotts Miracle Gro donated a camping chair; Signmark donated a gym bag and Fowler Chiropractic donated a certificate for 8 deep tissue laser treatments valued at $320. 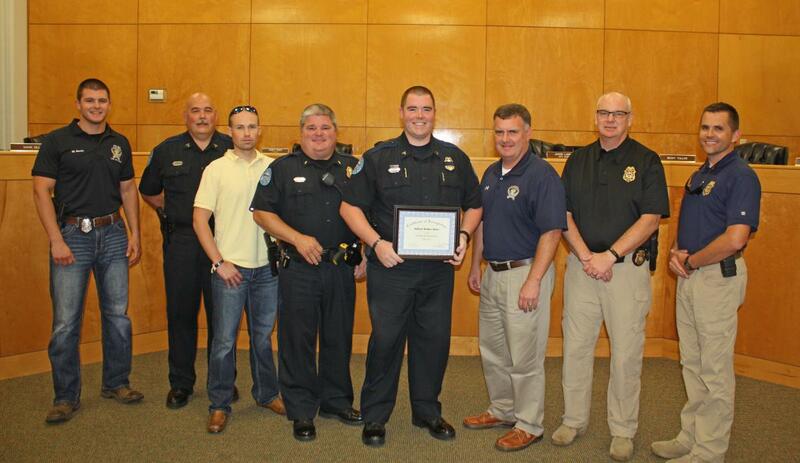 We are proud to announce that the Pearl Police Department Officer of the Month in May is Officer Justin Barnette. Justin joined the Pearl Police Department in 2011 after graduating from the Mississippi Law Enforcement Officers’ Training Academy. He served as the DUI Enforcement Officer from 2012 to 2013 while he was a member of the Pearl Traffic Unit. In 2011 he was awarded the 50+ DUI Award and the 100 DUI Club DUI Award in 2012 and 2013. He was awarded the Seatbelt & Child Restraint Award in 2012 & 2014. Officer Barnette has also been a member of the SWAT Team, Honor Guard and Emergency Operations Team. He has completed numerous hours of training and certifications including Accident Reconstruction and Child Passenger Safety. On April 25, 2015 Officer Barnette responded to a call at a local motel in reference to a robbery report. Upon his arrival he began speaking with the complainant and due to his attention to detail, he began to notice that things did not seem to add up. Upon further investigation, along with Detective Brown, who was the detective on call, the initial call turned into three arrests for prostitution, robbery, foreign warrant and several other charges. Officer Barnette’s dedication and attention to detail is a great asset to the Pearl Police Department. Office Barnette is a 1999 graduate of Pearl High School and has been a resident of the city of Pearl for 30 years. He is an avid hunter and outdoorsman. He and his wife Charlene have two children. The Pearl Chamber of Commerce presented Officer Barnette with a framed certificate, a $100 Bass Pro Gift Card and a Cracker Barrel Basket complete with a meal for two. Justin Null – Alfa Insurance Agency donated a $50 Outlets of Mississippi Gift Card, Buckley Security donated a $25 Frisco Deli Gift Card, MedScreens donated a $25 Kroger Gift Card, McAlister’s Deli donated a certificate for meal for two and Moss Creek Fish House donated a $25 Gift Certificate. Scotts Miracle Gro donated a camping chair, Signmark donated a soft side cooler and Fowler Chiropractic donated a certificate for 8 deep tissue laser treatments, valued at $320.